In the section on the anatomy of the head we showed that non-physical factors like mood, temperament, and character are more important than biological functions in moulding the forms of the face and giving it individuality. These factors are thus at least as important to the draftsman as a correct rendering of physical proportions. A portrait must reproduce the personal character of the sitter's face and not just show a type of head. Nothing in the living world lends itself so easily to abstract drawing as a face. All our lives we read human faces into all kinds of living creatures, and indeed into inanimate things having nothing to do with people-in the graining of wood, flowers, the contours of hills. These phenomena can give as deep an impression of personality as the real faces of people and animals. There is great scope here for artistic expression, but this book is concerned only with the foundations of naturalistic representation as the basis for every kind of artistic interpretation. We learn drawing as we learn to write at school; how and what we write later is no concern of the teacher. When fitting the parts of the body into a geometric scheme, we likened the head to an oval. This oval, like a bird's egg, can vary greatly in shape, from long and narrow to almost spherical. The head is never a cuboid structure. The ever-present tendency to abstraction, a tendency quite independent of a deliberate stylization like cubism, often makes people forget this. Students are often astonished, looking at a head for the first time from above, to notice that there is not a single flat frontal surface to be seen. Observed from above, the face, so often depicted far too flat, falls sharply away to the sides of the head, and the crown and brow build yet another oval. Awareness of this is an important step forward. For a deeper understanding of the shape of the head, and particularly of the face, it is useful to draw the chosen view as a relief map with contour lines. 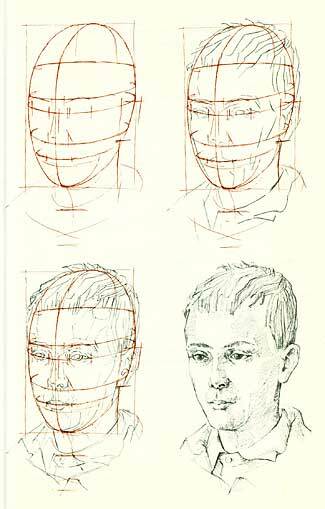 It is equally valuable to draw the head in many varieties of profile, both held erect and at various angles. All this helps to make the student more aware of the roundness of the head. Apart from an external, formal resemblance to the sitter, a portrait is concerned primarily with finding a characteristic and consistent expression. There is no rule for achieving this, but it is helpful to know that the more the nonessentials are left out, the stronger and more determined is the expression. A portrait drawing begins systematically from the linear scheme, from the relation of height and breadth in which the oval is contained. 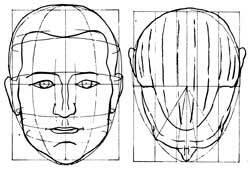 The slightest turn or bend of the head curves the straight lines into meridians, foreshortened by perspective: through the corners of the eyes, below the nose, through the meeting of the lips, the fold of the chin, through the eyebrows, and the beginning of the hairline on the brow. Into this scaffold of elliptical lines further points of measurement are marked: the width of eyes and mouth, the fold of the chin, the beginning of the hairline, the setting of the root of the nose, the nostrils and the breadth of its bridge, then the ear, its position and outline. The first working can also indicate the line of the eyebrows and the folds of nose, lips, and corners of the mouth. The second phase of work starts with the main shapes in the regions of the eyes and mouth, and the lay of the hair. Ear, cheek surfaces, and temple can receive the broader details. The third phase turns to greater detail, particularly the exact outlines which give individuality-but with the gentlest possible drawing. Preliminary softness in drawing the lines allows the. fourth phase to pick out what is essential and characteristic until the portrait is worked up to the desired degree of finish. This is the disciplined and scholarly way, and the way most certain of success in setting about to reach a "likeness," that desired goal which commands so much respect and which causes so much alarm among the inexperienced. It is a mistake to try to find the likeness right at the beginning instead of allowing it to grow out of the exact pursuit of the individual shapes and lines. However, this close attention to the individual shape must not become a routine which makes all the portraits from the same hand look as though the sitters were all relatives, a danger run by many professional portraitists. There is no need to treat every portrait as a first beginning, which would inevitably produce an academic aspect. Academic discipline is only a means to an end, which, with experience, should lead to a personal form of expression, in the same way that a personal handwriting grows from the school copybook. The well-worn critical comment that much has been "put in" a portrait is misleading. A human face is much more significant than a cast and nothing needs or should be put in it, rather much should be taken out in order to emphasize what is essential and particular. The choice of what remains depends on the maturity of the artist and his temperament, his perception and ability to assess the significance of facial features. The most easily accessible model is the artist's own reflection in a mirror. For study purposes it is quite unimportant that it is seen in reverse. But if one wants to make a true portrait, it is quite possible to train oneself to make a mechanical reversal of the reflection, altering the coordination of hand and eye to produce a mirror image. Rembrandt, one of the greatest painters of all time, repeatedly studied his own reflection. He did not do this from vanity - he was by no means a handsome man. He painted himself because the sitter was always available, and he did it uncritically, for he was entirely preoccupied with the problem of light and shade. Over one hundred of his self-portraits survive and are among the most compelling ever painted.